This video is presented in ASL with spoken English interpretation. Many thanks to the Accessible Materials Project (AMP) for providing such a wonderful variety of videos in ASL! Check out their YouTube channel here. For more information about Georgia Pathway to Language & Literacy, please visit our website at www.georgialiteracy.org or email us at gapathway@gmail.com. Emily Elswick sat down with Sophie Edwards to share her story of teaching children who are deaf and hard of hearing. What led you to your career as a LSLS (Listening and Spoken Language Specialist)? I went to grad school for Speech Pathology. I was an Elementary Education major in college and didn’t have an undergraduate degree for speech. Part of the requirement was that I had to observe clients before practicing my clinicals. One of the clients I observed was a little boy with a cochlear implant who was in the transitional period of signing and spoken language. He was talking about how a caterpillar turns into a butterfly and he was trying to form words as he was signing. I just fell in love with the deaf population during that observation and pursued the AV track at that university. What do you believe is the greatest thing that you can bring to the classroom? I would like to think that I can captivate an audience. I would like to think that the children in the classroom are attentive to me and in turn that motivates them to learn to listen and want to express themselves in words. I also feel that I owe it to the children and their families to stay current on the latest research and techniques. What’s a common challenge you face in the classroom? I think in the classroom, not just when I work with a child in AV therapy, in the classroom, I’m often working with grandparents or nannies, or a variety of caregivers. It’s a challenge trying to get everyone on board with the same information. Classroom management, for me, is often a challenge – even coming from an Elementary Ed background! I think that routine helps. 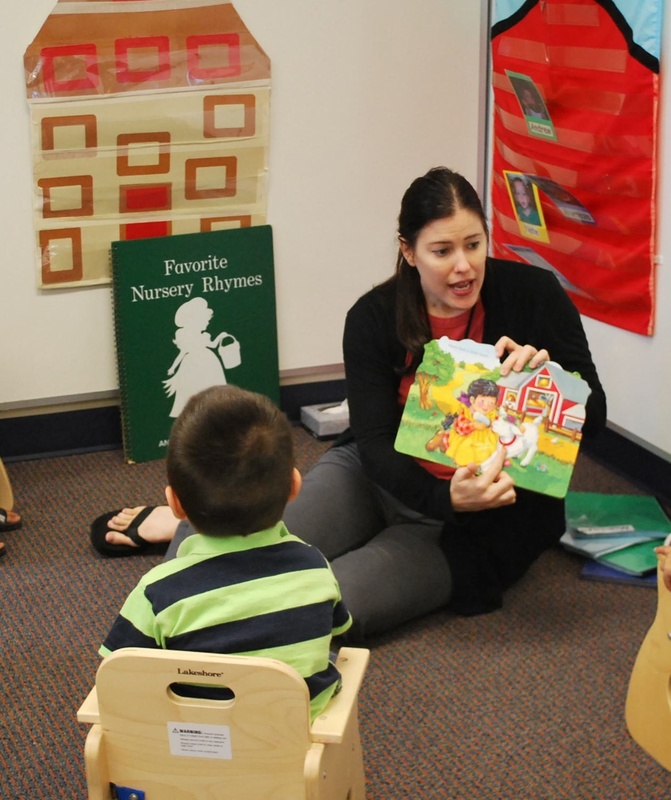 Keeping the classroom very structured is essential – especially working with two-year-olds! What is a teaching strategy that’s been helpful for you? I find that with the age range I work with, the children are really responsive to songs and music, so I sing everything we do. We sing the good morning song, we sing the good-bye song, we sing the cleaning-up song, we sing the gluing song! I think that the repetition and the melody make it really motivating for the children. Oftentimes, a child’s first words are the words to a song. I use that a lot in the classroom. What is something that parents of children who are D/HH should know about their child’s education? What’s something that you’d want to fill parents in on? I hope that the parent knows that my goals are their goals. Just like them, I want their child to reach his or her fullest potential. I encourage parents to go out and observe classrooms that their child is in and become really involved in their child’s education, asking questions if they don’t understand something. Not breezing through an IEP (Individualized Education Program) meeting, for example. What would you tell the parents, as far as what they can do to help their child succeed inside and outside the classroom? To answer both of those questions in just one sentence: just be involved. When you’re involved in the classroom, you know what your child’s goals are, you can see how the teacher’s trying to elicit the goals, and you can carry those goals over at the home, utilizing the same strategies that the teacher is using. The child then reaches that goal faster, because you’re working twice as hard. Do you have a favorite memory or story from a child you’ve taught? A child’s success? I have so many. It happens on a daily basis. Do you have one that sticks out in your memory? One memory kind of sticks out in my mind. I was in AV therapy with a family and this particular child had not yet uttered a word. She was working on her learning to listen sounds and familiar songs. We were singing “Where is thumbkin” for probably…I don’t even know how many times we sang this song together! She uttered her first words, which were actually a phrase. She said, “Run away, run away,” which is part of that song. Her mom burst into tears. That was just a really good moment, a really motivating moment. Repetition can get kind of mundane to therapists and parents alike, and it just goes to show how important that review and repetition are in therapy. Even though you’re tired of it, the child still needs it. How can other teachers replicate those strategies? Keeping expectations high, and knowing that that’s what it takes. So even if you get discouraged, you know it’s going to pay off. What advice can you give teachers to help them along to the goal (of having all deaf and hard of hearing children read on level by 3rd grade)? Just knowing that literacy starts at such a young age. It starts with a child observing their father reading the paper or watching their mom read a book. It starts with the child learning how to hold a book, how to treat a book, the left to right sequence of things. Just knowing that a child is never too young to be taught literacy and reading strategies is important. Literacy starts from the very beginning of a child’s life, when a mom is reading a bedtime story to her baby. It’s also important for the teacher to realize what an integral role parents have in fostering literacy within their child. What are some teaching strategies that parents can use at home? Read to them and model good reading habits. Teach them how to treat a book. I think just those little things are really important. Having parents include their young child by maybe having the child turn the page. Do you have any encouragement for teachers who may be the only D/HH teachers in their school or their district? I was a speech pathologist in a very rural part of NC before I moved to Atlanta. I think the encouragement comes from working with children and seeing progress. I think you have to really be creative with your lessons, though … You have to be creative and figure out how you can target a goal using something that is motivating to the child without these technology perks. That would be my advice. Get creative. Get down to the scissors and glue and tape of therapy and of your classroom activities. Emily Elswick is a Speech Pathologist, who specializes in Auditory Verbal Therapy, or Listening and Spoken Language.